Palm Springs is a place like no other. Whether exploring downtown, basking in the sun by a sparkling pool or playing at one of the many nearby championship golf courses, Palm Springs has no shortage of activities, whether you prefer to be inside or out. 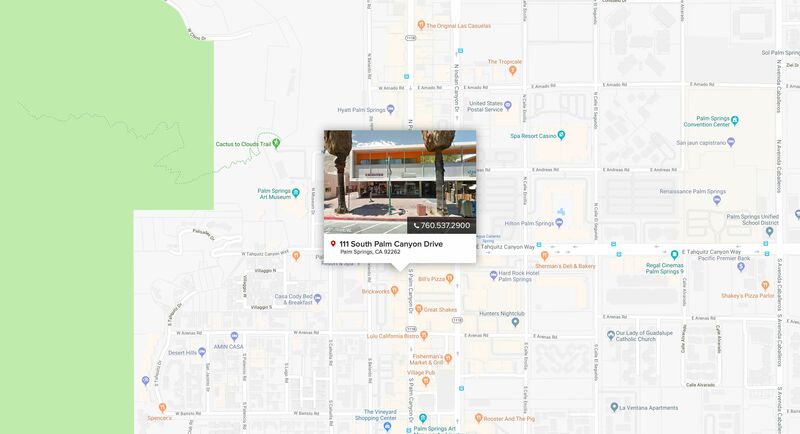 Located in the Coachella Valley at the foot of mountain ranges, this popular desert community has often been referred to as a “modern mecca” primarily for its collection of mid-century architecture. Many of these historic properties are where the likes of Frank Sinatra, Bob Hope, and Elvis Presley once lived. Renowned architects, such as Richard Neutra, E. Stewart Williams, and Albert Frey, to name a few, left their undeniable mark to build some of their best and well-recognized homes in this resort city. Today, Palm Springs hosts a variety home styles in all price ranges, from small condos to large estates, making this a popular destination for retirees, investment buyers, snowbirds and those who desire a second vacation home. However, Palm Springs is not just a winter/spring destination, as it now provides year-round entertainment, such as the highly respected Palm Springs International Film Festival, headliner concerts including the nearby Coachella and Stagecoach music festivals, celebrity golf tournaments, art festivals and much more. Palm Springs boasts a wide selection of boutique hotels to opulent resorts while restaurants range from California modern to excellent ethnic eateries and casual dining. And shopping? Palm Springs offers one of a kind stores selling everything from mid-century furniture to vintage clothing, particularly along downtown’s historic Palm Canyon Drive.